Last Friday was the opening of a new exhibit in the Artist Hall at the Houston Center for Contemporary Craft – Detritus. Jim & I were able to volunteer that evening for the positions of bartender and “gallery guard”. Scheduled for this week was the annual Volunteer Appreciation party which we would not be able to attend. 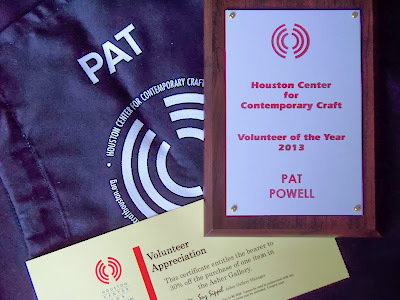 So on Friday, I was both surprised and very flattered to be presented with the HCCC Volunteer of the Year Award. What an unexpected honor. I have really enjoyed the time spent here. The staff is a great bunch to work with and there are always fun and interesting activities to help with. The exhibitions continue to be interesting and often thought provoking. I look forward to my continuing volunteer time here and want to thank everyone for this honor. P.S. In additon to a commerative plaque, I also received a gift certificate from Asher Gallery (where they have fabulous gift items) and an HCCC personalized apron. I can’t tell you how much we all lusted for those aprons when they were first brought into service for the Family Day event this year. Now I have my very own! 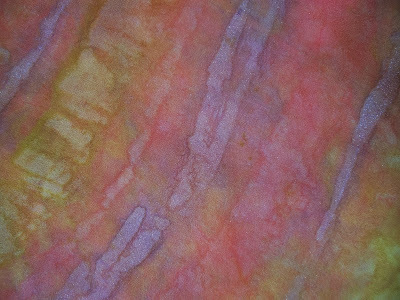 At the International Quilt Festival this year, I took 2 workshops. One was Paintstik Inspirations and the other was Coloring Fabric with Paints. Aside from having to get up before the roosters to get downtown, the workshops were both great. 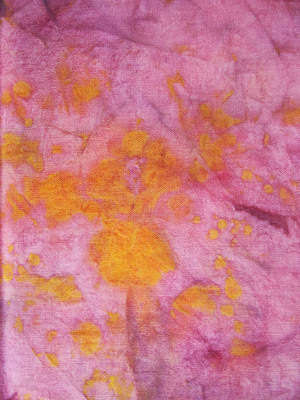 I have been doing some experimentation in fabric painting. 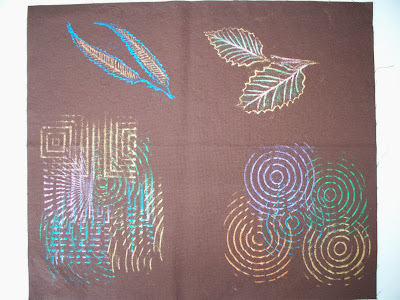 All the above were painted with Jacquard fabric paints: both Textile and Dye-Na-Flow. The top and bottom pictures are both cotton. The middle pictures are silk chiffon. 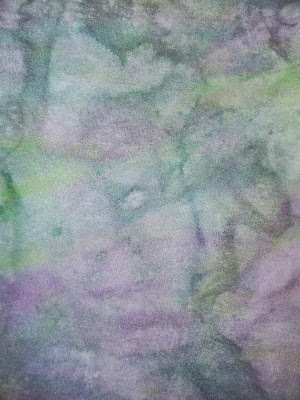 I have a couple more pieces drying including one I did using Golden Acrylics mixed with GAC-900 Fabric medium. It is a beautiful scarf. 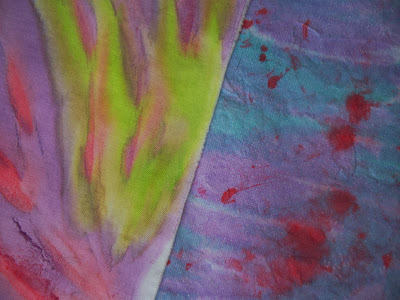 The only problem I had with it was when I painted it I used the freezer paper with its paper side up under the scarf (this creates no problem with fabric paints). The paper did stick to the scarf and I have been slowly cleaning it off. Next time, the shiny side will go up! Will publish a photo as soon as I can heat set it. Here’s a photo of one of my Paintstik workshop pieces. I haven’t done any Paintstik samples as yet. Waiting for a couple more painted pieces that I can use as a base for the Paintstiks. Won’t be long.